Jeannie Seely was hosting the Opry segment when Bobby Bare was surprised with the invitation. Bare started his set by collaborating with Mary Gauthier on the song “I Drink,” written by Gauthier. Then Bobby Bare, Jr. joined his father on the stage to sing the 1970 hit “Come Sundown.” This is when Garth Brooks took the stage. There have been many true country music “Outlaws” over the years, and many more that claim to be. But there can be only one original Outlaw, and that is Bobby Bare. Without Bobby Bare, there may be no Waylon Jennings. When Bare discovered Waylon in Phoenix, AZ in 1964, Waylon was still very much a regional act. It was Bobby Bare that introduced Waylon to Chet Atkins at RCA in Nashville, and helped bring Waylon’s career to the national stage. It was also Bobby Bare who first rebelled against Chet Atkins, RCA, and the Nashville system, which in the 60’s put all the creative power in the hands of producers, and didn’t allow artists to record with their own bands. Before Waylon, it was Bobby Bare who forbid session musicians from playing on his songs, and started picking out his own material from renegade songwriters such as Shel Silverstein, Kris Kristofferson, and Billy Joe Shaver. It was Bobby Bare who helped inspire Waylon Jennings and Willie Nelson to extricate themselves from their restrictive RCA contracts, and stimulated the Outlaw movement of the early 70’s in earnest. But that’s not what Bobby Bare is best known for. He’s known for his early country mod material, appearing in suits and singing Countrypolitan songs of the time such as “Detroit City” with its lush chorus lines. Later he would be known for the novelty songs by Shel Silverstein, and Paul Craft’s “Drop Kick Me Jesus.” Though no less an Outlaw than any of the other greats of the era, Bobby Bare didn’t have the rough persona preceding him like Waylon did. He didn’t have the crossover or acting success of Willie Nelson or Kris Kristofferson. His output was quality, and timeless, but perhaps not as defining of an era as others. Yet without Bare, the Outlaw era arguably may have never happened. But we can’t reinstate Hank Williams?? Congrats to Bobby bare. No, we can’t “reinstate” Hank Williams. He’s been dead for 65 years. When can we get in D.A.C.? If they thought he could keep it clean for a 3 song set, he’d probably already be. Mary Gauthier does not quite fit in the picture to me. She’s also a frequent guest on the Opry. Much more so than any other name in this story (other than Janson, probably). Congrats to Mr. Bare. Hey Opry, how about admitting Elizabeth Cook, Jim Lauderdale and Dale Watson in 2018? Congratulations to you, Trig! I know you put a lot of time into writing about who the right inductees and members should be for these hallowed institutions. Feels like a win for the good guys! It’s odd that you bring him up tonight. I heard of him for the first time earlier tonight; he’s playing a show with a friend of mine and Ricky Skaggs in a few weeks that I believe I will be working. Small world. Bare’s last album, a few years ago, “Darker Than Light” was as good as any of the American Recordings albums that Cash did with Rick Rubin. It should have gotten a lot more attention than it did. He released an album last year, “Things Change”, probably one of the best albums of the year. and c) being more or less ignored by country fans. And Willie puts out an album every year. Maybe more. Not like Clint Black and Travis Tritt–who require a blue moon, a lunar eclipse, a solar, eclipse an act of God and an act of Congress–all in the same month–before they can put out a new album. Now,how about making Rhonda Vincent and Gene Watson Opry members? Congrats to Bobby for the great honor. Man, I cant stand Garth. Always sounds like he is trying to sell a set of steak knives to the crowd. Yeah, but let’s face it, he wouldn’t have been there if he wasn’t really a fan of Bare’s. Hell, most of the stories I’ve read about what happened last night read more like they are centered around Garth than Bare. Just how Garth likes it. Did Garth mention his newest Wal-Mart exclusive anthology set before introducing Bobby? Congratulations Bare! Over those several tours in the US and Europe during the middish eighties, you put food on my table and paid the rent, while I had the pleasure of playing piano with one of the greatest. Life is good. I’ve been listening to Bobby Bare’s latest album “Things Change” and it is a Winner! Great songs and its good to hear his music on Outlaw Country and Willie’s Roadhouse on Sirius-XM. I wish some label would re-release his “Drunk and Crazy” and “Down and Dirty” albums on CD as these have been out of print for a long while. I also recall Bobby’s Bare Trap in downtown Nashville before he and his wife Jeannie moved the store out to Hendersonville. But I digress… Congrats to Bobby Bare on re-entering the Grand Old Opry. Cheers and Twangs! So this means everyone that doesn’t fulfill the required minimum yearly appearances will be booted out, right? Looking at you, Blake Shelton, Garth, Alan, et al. Very nice honor for the great Bobby Bare, still feel sad that the Opry shamelessly ignored Kitty Wells request to be reinstated as a member in the 90’s (as well as petitions by her fans in the 00’s in the internet age). The woman was the QUEEN of country music!!! The Opry has often been very generous in signing up male vocalists long past their hit days as members – Johnny Paycheck, Johnny Russell, Roy Clark, etc. – which is great and well-deserved, but the only woman I can think of who hasn’t had a hit in years that they ever signed is Crystal Gayle. Delighted he’s come back to the Opry. Met him numerous times in the 80’s when he toured the UK. A big favourite over here on this side of the pond. 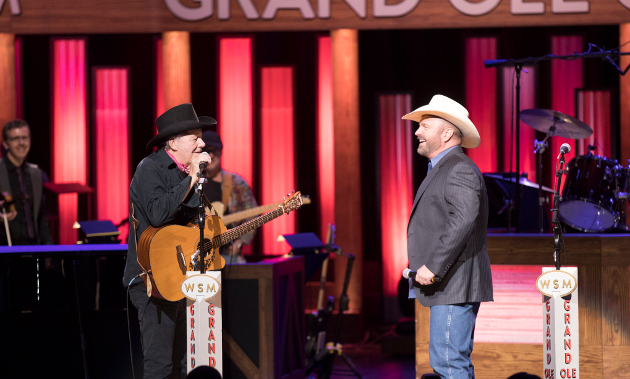 On a different but related topic, I’m always amused how the the fans at the Opry are said to be “shocked” when a superstar such as Garth Brooks walks out on stage to invite someone to become a member of the Opry. Surely the word should be “delighted” or “thrilled” or something less dramatic than shocked. Having said that I’d probably be shocked if someone walked out onto the stage and invited Luke Bryan or Bebe Reska or even Kelsea Ballerini to become a member of the Opry. I would, to be honest, be more than “shocked”, I’d be bloody furious as to how they have demeaned that honour over the years. Great news! Glad he’s back in.